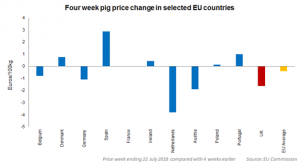 In the week ended July 22, the average price reported to the EU Commission was €145.10/100kg, €0.76 lower than the previous week, and €0.40 lower than four weeks earlier. Increasing prices in 2017 mean the discount compared to last year has widened and is now around €25/100kg. In sterling terms, however, some weakening of the pound meant prices gained over 1.60p/kg compared to the level recorded four weeks earlier. The discount compared to year earlier levels is therefore smaller, at around 22p/kg. 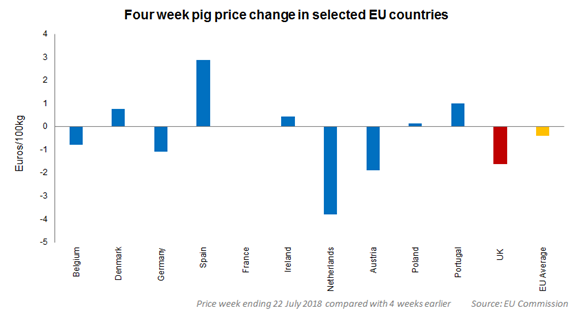 With UK prices only rising 0.9p/kg over the past four weeks (a decline of €1.62/100kg in euro terms), the gap between UK and EU average prices has narrowed slightly. Nonetheless, at around 20p/kg in the latest week, it remains larger than the long-term average. While there was broad stability in the average price for the region as a whole, individual markets put in very different performances, perhaps necessary to balance supply and demand across the bloc. Despite strong production growth earlier in the year, Spanish prices have been rising more recently. This may be related to some tightening of supply following the current hot weather conditions, alongside peak tourist season. Trade has also been underpinned by a good export performance, particularly to Japan and South Korea. Prices in China have been low this year and the EU has felt that particularly in the value of its exports. The lower export value has also limited prices at farmgate level. The EU is yet to materially reap any benefits from the US-China trade dispute, and it remains to be seen how this will develop in the coming months.